The triple-lock protection for state pensions should be dropped to save billions of pounds for better causes, according to the outgoing pensions minister. The Department for Work and Pensions declined to rule out a review of the “totemic” policy in the coming months. Under the triple-lock guarantee, pensions have risen every year since 2010 by whichever is the higher figure – the rate of inflation, average earnings or a minimum of 2.5%. This has lifted many pensioners out of poverty, but Baroness Altmann, who left her post as pensions minister this month, said the cost beyond 2020 would be “enormous”. In an interview with the Observer, she said the billions of pounds of spending it entailed could be better used, following a period in which pensioners have enjoyed swiftly rising living standards relative to the rest of society. Altmann also revealed that she had privately lobbied David Cameron a year ago to drop the commitment of hiking pensions year-on-year by 2.5% when earnings and price inflation are low, but that the then prime minister had blocked the change on political grounds. The Tory peer added that she believed the abandonment of the policy is possible now Theresa May is in Downing Street. The prime minister’s chief of staff, Nick Timothy, has previously written that the triple lock was an obvious policy to dispense with in order to redistribute welfare cash to help the low paid. A DWP spokesman would not comment on speculation about the future of the triple lock, but that it was normal practice for new secretaries of state to examine the merits of their policy portfolios. Altmann said: “The triple lock is a political construct, a totemic policy that is easy for politicians to trumpet, but from a pure policy perspective keeping it for ever doesn’t make sense. I was proposing a double lock whereby either you increase state pension in line with prices or with earnings. “Absolutely we must protect pensioner incomes, but the 2.5% bit doesn’t make sense. If, for example, we went into a period of deflation where everything, both earnings and prices, was falling then putting pensions up 2.5% is a bit out of all proportion. Politically nobody had the courage to stand up and say we have done what we needed to do. The Office for Budget Responsibility estimates that the triple lock will add more than 1% of national income to spending on pensioners by the middle of the century, relative to the cost of earnings. Research from the Institute for Fiscal Studies suggests pensioners are less likely to be poor than younger age groups and that they have higher average incomes than working-age households. “Maybe politicians need to be a bit braver sometimes and explain carefully to the public rather than this lazy soundbite, if you like. Maybe there is a more intelligent way of doing it, and if you do drop the triple lock and save billions of pounds it could help avoid increasing the state pension age which has been such a difficult policy. Ahead of the referendum Cameron warned that Brexit could cause a “black hole” in the public finances and threatened the “triple lock” guaranteeing state pension increases. At the time, Vote Leave described the comments as “a frantic attempt to rescue a failing campaign”. 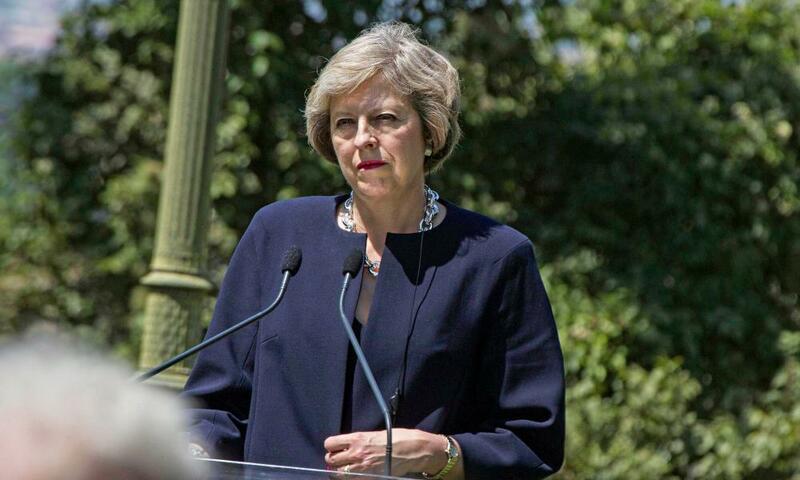 Meanwhile, the prime minister has announced “the next steps” in her drive to end modern-day slavery, on which she legislated while home secretary. There will be £33.5m in additional funding for projects to protect victims and bring perpetrators to justice. The announcement came as a year on from the introduction of the Modern Slavery Act – which included measures to seize traffickers’ assets and channel some of that money towards victims as compensation – an independent review showed that prosecutions were rising and there had been a 40% increase in victim referrals to the police.